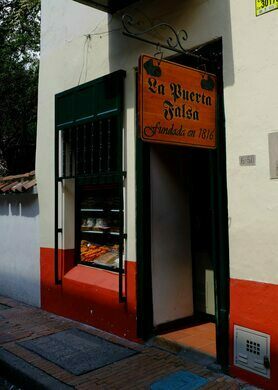 For just over two centuries, La Puerta Falsa has been serving traditional Colombian food to hungry patrons. The tiny snack shop/restaurant barely sits 20 people, but what it lacks in size it more than makes up for in home-cooking and a palpable sense of history. 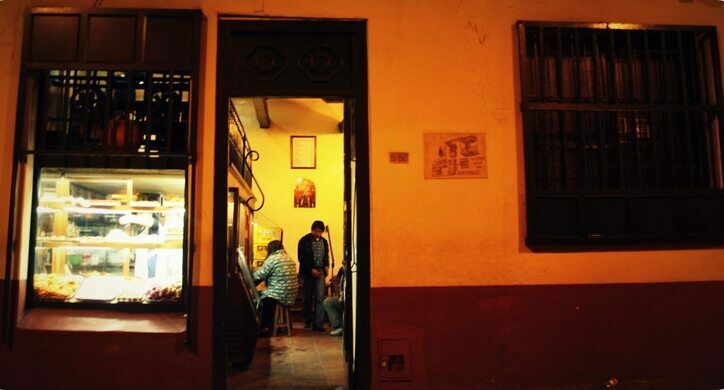 The shop is located in an old colonial home a block from Bogota’s Plaza de Bolivar. Walk in and you’ll see a wooden bar to the right, with space enough to seat 10 people. 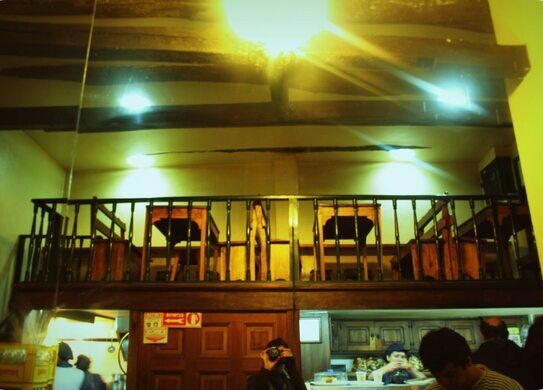 Follow a small staircase to the upper level and you’ll find three or four tables where loyal customers—including politicians, artists, and scientists—have tucked into tamales and bowls of ajiaco soup (made of chicken and potatoes) since the place opened in 1816. The name of the restaurant translates to “The False Door.” When it first opened, La Puerta Falsa had no name, it was just a hole in the wall for hungry passersby. But across the street from the snack shop was a false door set into the side of the Catedral Primada. This door served to confuse any would-be assailants in times of war or turmoil, and was a notable feature in the street. So locals began to refer to the increasingly popular eatery as “the place near the false door,” which in time simply became La Puerta Falsa. 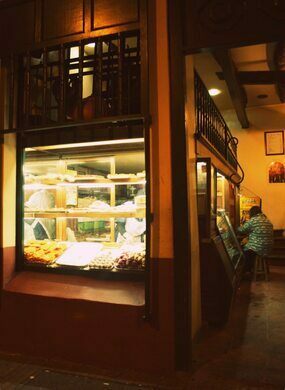 Today, La Puerta Falsa is well loved as one of the oldest and most traditional restaurants in Bogota, and it steadfastly hangs on to its traditional values. It's not flash, the menu is limited, service can be slow, and you won't find tacky souvenirs or other tourist trappings on display. 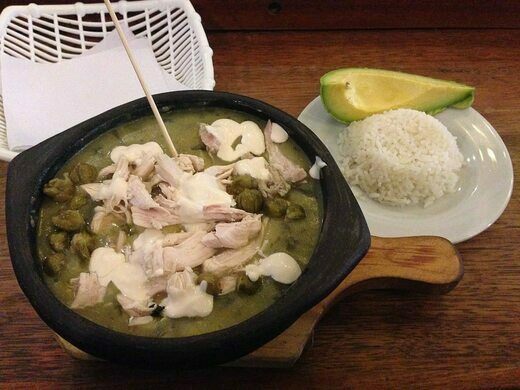 As for the menu, La Puerta Falsa is best known for its ajiaco soup and its tamales, which are often ranked among the best in the city. 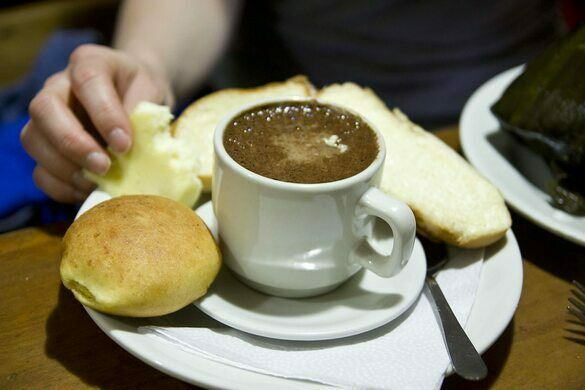 It also sells traditional sweets and chocolate completo, a traditional Colombian hot chocolate with cheese, buttered bread, and a biscuit. Opening hours are roughly from 7 a.m. to 10 p.m. daily, but don't expect that to be set in stone. Once known for its horse-powered knife sharpening, this 200-year-old shop offers an array of blades and hard-to-find culinary tools.